Irish Times mentions Irish Mortgage Brokers: Why is there a housing shortage? 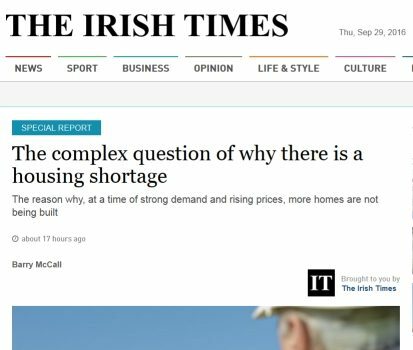 We were featured in today’s Irish Times on an article by Barry McCall asking ‘why do we have housing shortages’. This picture speaks a thousand words and in many cases tens of thousands of earnings that a person would have to have in order to afford an average home in different parts of the country. We used recent data from the Daft report and then broke it down into borrowings and compared that to average wages. The column after ‘county’ is the average price in that region. If we assume a first time buyer will typically want a 90% mortgage we then look at the amount of earnings they’d need to have in order to get the loan. The last column is where the real story lies, it compares prices in the area to average wages taken from the CSO. Anything in a white cell with a minus is very affordable, anything in black means you’d have to be earning above average wage to buy a property in the area. 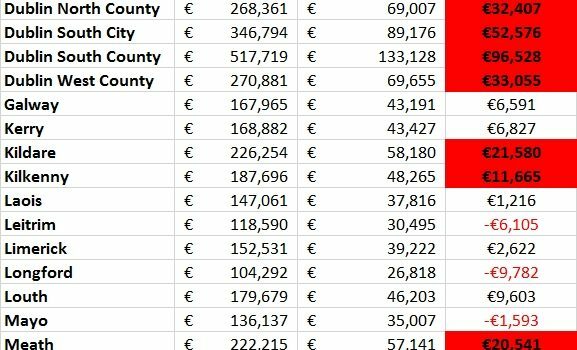 If the cell has a red background that is showing you where the difference is greater than €10,000. 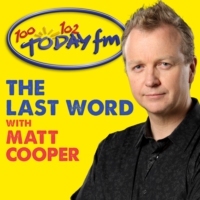 We were asked to discuss whether or not we have a property bubble at present in Dublin. We don’t have a ‘bubble’ but we do have a boom and booms often lead to bubbles so the time for action is now, not later. 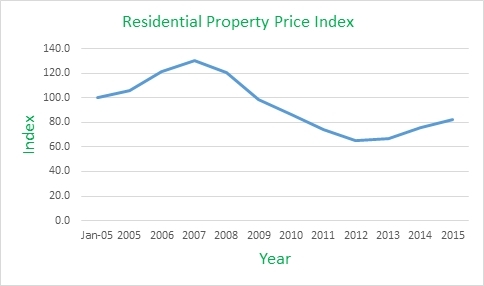 Jonathan Healy spoke to Karl Deeter about the rapid house price appreciation in the nation in general and Dublin in particular. The issue of too many constituencies all wanting different things came up as did some of the other aspects of the market, the main one of which is that we are showing the early symptoms of a housing crisis. 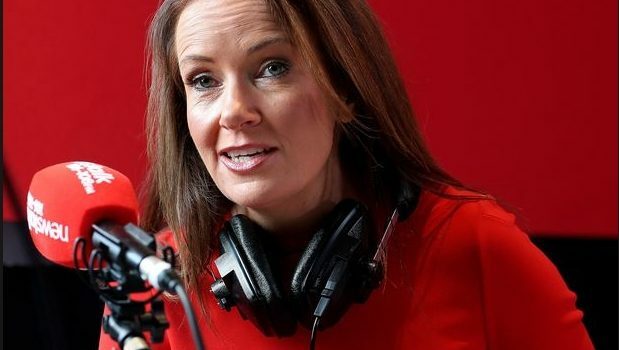 We were asked to speak to Audrey Carville on Drivetime (she’s covering for Mary Wilson) about property prices. This interview was highly enjoyable as we got to flesh out some complex ideas and taking the time to do it is not always available on live radio. See what you think of the analysis! Economist Robert Schiller of ‘Case Schiller’ report fame says that he believes the housing market will fall further, confidence is everything in the property market and he says that confidence is at a record low and that is one of the primary reasons for his feelings on future prices. This makes for some interesting viewing, his book ‘The subprime solution’ and another called ‘Irrational exuberance’ are both excellent reads if you want to get a view on the current situation from a man who saw this coming. A vital point he makes is that avoiding additional supply is part of the solution.